Three different packagers discover the efficiency, cost savings and increased production available through pneumatic conveying. A recent Packaging Digest benchmark study called "Automation in Packaging"reveals that 94 percent of packagers believe that flexibility and automation provide competitive advantages, yet many packagers and processors still use manual processes and outdated equipment that eat away at precious revenue. When contemplating the move to automated processes, those charged with streamlining production cite cost, flexibility, reliability and product quality among their top concerns. First and foremost among those concerns is how the process will affect product quality, as the moving of powder can typically change its size, density and texture. The nonwoven material was being ultrasonically sealed after the powder was dispensed. The product, a facial care application that had self-lathering properties, could be critically affected by how it's conveyed to auger fillers. If the powder particles became too small, the product would self-lather too fast upon use. It the particles became too large, the self-lathering process took too long. Changing the density, component blend and texture would produce inconsistent fill rates or volumes-both unacceptable by quality control standards. "Because product manufacturing speed ultimately sets the price, our goal wasn't only to develop the product but also to develop a process that maintained quality at the necessary price point," says Pacon's vp Mike Scaduto. "To do this, we had to minimize labor while meeting stringent consistency requirements for moving and dispensing our powder at high volume." Pacon investigated traditional ingredient-transfer methods but found these had drawbacks for the application, including production interruptions and a degraded particle size. A positive air-based conveying system looked promising, but disrupted the product's particle size too much when the product was transported through piping. Like the other methods Pacon considered, the air conveyor would have occupied more production space than Pacon desired, and might have been difficult to sanitize with a 70-percent alcohol/water solution. The system that satisfied all of Pacon's needs actually turned out to be pneumatic. Supplied by Vac-U- Max (www.vac-u-max.com), the system consists of two low-profile drum-dump stations for easy loading, powered by a negative vacuum through conveying line piping to the three auger fillers. One drum dump station supplies powder to a single auger filler, while the other supplies the remaining two auger fillers. Because the powder can change density in the auger filler head, leading to improper fills, keeping the head full and at proper density is critical. To maintain proper powder density in the auger filler heads and affect accurate fills, Vac-U- Max mounted powder receivers with customized multi-filters above the auger fillers. Vac-U-Max also applied a high polish finish to the conveyor interior and exterior, reducing powder sticking inside the system and rendering the exterior easier to clean. Vac-U-Max modified the powder receivers to help transport the powder without degradation, and customized standard components to fit the processes and product, reducing the potential that the powder would degrade and maintain powder quality. In addition, a device checks the powder level at each of the three auger filler hoppers. When more powder is needed, predetermined volumes of powder are automatically delivered to the hoppers. The system is designed for ease of maintenance. The modular conveyor pipes have a specially designed receiver for quick, tool-less assembly/disassembly and easy cleaning. The drum-dump stations are fabricated with no crevices and few welds. Interior bends and corner welds have a minimum '/a-in. radius to minimize material accumulation. A line discharger purges the conveyor at the end of each conveying cycle to prevent fallback of the powder and make restarts easier. 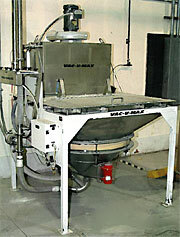 Upon the conveyor's installation, Vac-U-Max worked with Pacon to adapt the system to Pacon's needs. Instead of hanging the conveying pipe from the ceiling or supporting it from the floor, Vac-U-Max suspended it over Pacon's equipment so i that it requires no floor space and can accommodate a vertical receiver-adjustment mechanism designed by Scaduto. The result is a modular system that can also be relocated, if Pacon desires. Like Pacon Mfg., Cafe Soluble, a producer and packager of roasted ground coffee located in Managua, Nicaragua, had also considered mechanical conveying systems. But it rejected those methods, including a hybrid system of screw conveyors linked with a batch scale, because they took up too much space or they lacked the flexibility CafE Soluble desired. After the company experienced exponential growth, however, Cafe Soluble's plant manager, Ernest Hurtado, assisted in overhauling the manual operation that had handled all of the plant's batching, blending and intermediate steps. "We had an army of people moving cases [of coffee] around," he says. "We grew so quickly that we couldn't perform all of the material handling." When evaluating options to improve the material handling, batching and blending steps, Cafe Soluble sought a system that could grow along with it and still fit within its budget. "We knew that at some point, we would have to change the design and move thing; around a little bit," adds Hurtado. "But a screw conveyor or a bucket elevator would require a lot of production space." 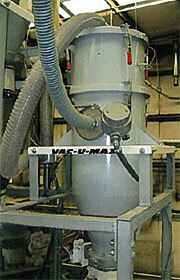 The Vac-U-Max system fit within the company's requirements. Like Pacon Mfg., Café Soluble chose pneumatic conveyors that are "very mobile," says Hurtado. "You just plug in an air connection, and you're ready to go. You just need suitable overhead support, which can be as elegant or as crude as you like. But it's a very flexible system." Café Soluble overhauled its material- handling and batching systems with the installation of six vacuum receivers. Two of them are outfitted with load cells and a weight control system and function as weigh hoppers over two blenders. The other four vacuum receivers are installed in pairs, with a pair on each of two hoppers that feed the coffee-packaging machines. The installation has virtually eliminated manual material handling, relates Hurtado. Café Soluble's coffee-packaging operation begins at a grinder that discharges the ground coffee into small hoppers, each dedicated to a particular coffee variety. As the coffee fills the hoppers, vacuum receivers over the blenders generate negative pressure and pull the coffee from the various hoppers through a series of conveying lines. When the company's coffee reaches the end of a line that stretches 10 m long, a vacuum receiver is filled until the target weight is achieved. Typically, a Vac-U-Max vacuum receiver will pull 20 lb (9 kg) of coffee from a hopper before discharging it to the blender below, Hurtado says. By repeating the operation 16 times, the batch grows to 320 lb. A worker then makes minor manual additions to finish the coffee recipe, and the blender mixes that batch of coffee. As that blender operates, the other receiver is loading the second blender with product. This transforms a batch operation into a continuous one. One cycle-loading, blending and discharging-takes about 15 min. After blending, the coffee discharges onto a screw conveyor that feeds a bucket elevator. The bucket elevator carries the blended coffee to a floor-mounted silo that holds the coffee until it's required at the packaging machines. When the time comes, the four vacuum receivers mounted on the packaging feed hoppers work in tandem to withdraw the coffee, which then travels 10 m vertically before discharging into the feed hoppers. Vac-U-Max level switches control the operation of the four vacuum receivers by signaling for more coffee when the level of product drops below a certain point. The switches also stop the vacuum receivers when the level in the hopper reaches the high setpoint. The coffee then flows to a set of vertical form/fill/seal packaging machines, each with four lanes that package about 1,750 lb (800 kg) of coffee/hr. Although the initial cost of the pneumatic conveying system was higher, the payback in the cost savings of the installation and the reliable operation favor pneumatic conveying. "The conveying and weighing are now done in one operation, whereas if we used separate components, we would have had to buy screw conveyors or bucket elevators from one source and weighing equipment and the controllers from another source," Hurtado explains. "We saw a big savings on the batching system, compared with buying one separately." Before overhauling its operation to pneumatic conveying, Cafe Soluble required 40 workers within three shifts. Now, it requires only 12 workers for three shifts. Reducing labor and increasing production speeds aren't the only ways that pneumatic conveyors generate cost benefits. Pneumatic conveyors also increase system reliability, adding hours of production to the schedule. Doumak Inc., considered one of the world's largest marshmallow producers, increased production by nearly 500 hr/ year by adding a Vac-U-Max pneumatic conveying system to its packaging operation in Bensenville, IL. Mike Morgan is a veteran of food industry production who has worked at a number of plants over the years and has served as maintenance supervisor at the Bensenville plant. "There is virtually no maintenance or cleaning necessary in the pneumatic conveying systems because they have few moving parts," Morgan reports. "We just clean or swap out hoses and check the motor and oil twice a year. That adds perhaps 30 hours a year of production, compared to monthly preventive maintenance on 20 or so moving parts on other types of conveying systems." The numerous pinch points on bucket elevators and conveyor belts can sometimes compromise product quality. If an excessive amount of starch should remain in the equipment, product quality could diminish and production costs rise as materials go to waste. Respiratory hazards can be a factor, necessitating that operators wear dustmasks or respirators. There can even be explosive hazards if dust or powders such as starch mix with the air in certain combinations. Instead of dumping marshmallows into packaging machines at an inflexible pace, Doumak's vacuum receivers pneumatically convey the marshmallows through six food-grade hoses to its packaging machines on-demand. "There's a need for flexibility and integration that's often unmet by conventional equipment," Morgan says. "When a packaging machine malfunctions, production can shut down for at least 30 minutes. Our 24/7 plant operation needs constant throughput. On a production schedule that tight, any downtime immediately impacts revenue." Essential to plant efficiency is the ability for conveying equipment used in production to properly coordinate with packaging equipment. When a packaging machine goes offline, Morgan says product should be re- routable to operating machines. 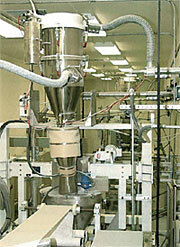 The conveying equipment should adjust speed when the marshmallow bagging machines fill bags of different sizes. "With pneumatic conveying, if a packaging machine malfunctions, we can easily divert product to the other machines at the touch of a button," he says. "The feed control lets the baggers to run at peak efficiency. Pneumatic conveying adds hours a week to production, eliminating many bottlenecks." Reprinted from Packaging Digest, October 2008. Copyright© Reed Business Information, RBI"' a division of Reed Elsevier, Inc. All rights reserved. Page layout as originally published in Packaging Digest has been modified.